This weekend, I submitted my entry to Emily’s “Fall Color Photo Contest”. 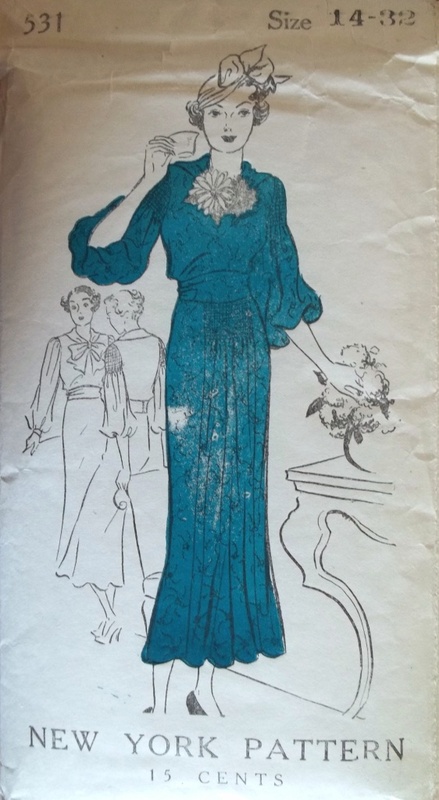 I was sorely tempted to submit a mid-1930’s outfit made from this pattern (see at left) out of a rust cranberry colored paisley with brown and gold tones. 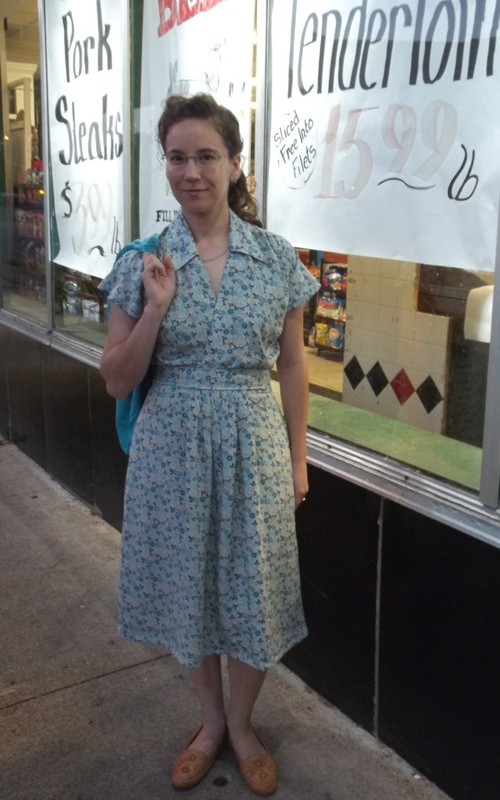 I have yet to blog about this dress despite being very proud of it. 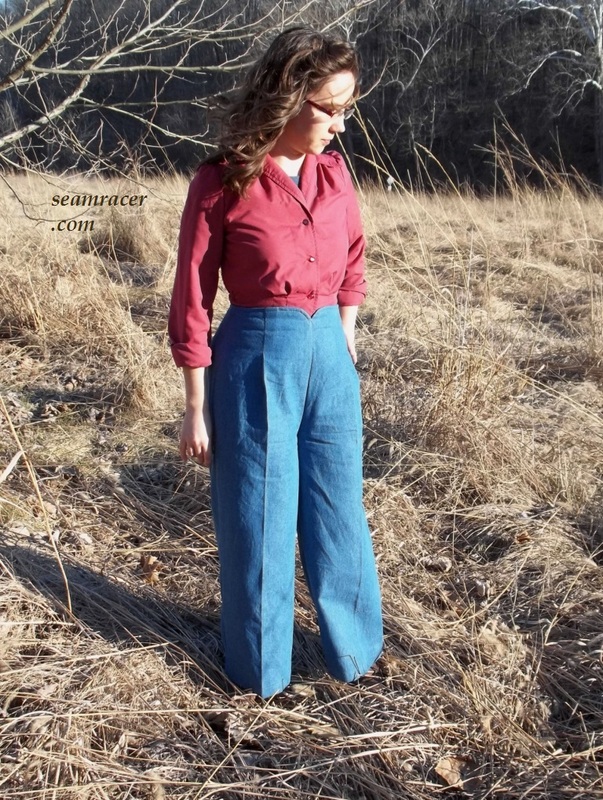 “My outfit incorporates my sewn projects and authentic vintage, as well as several different recurring fashion ideas mentioned from the inspiration articles. 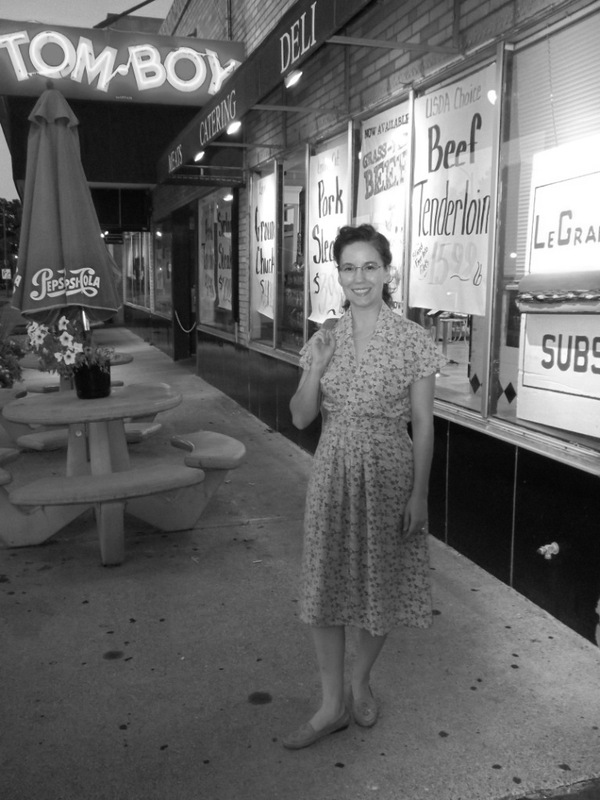 Here I am channeling the mid-1940’s. “Brown Proves Popular” article was my main inspiration. Alligator ankle strap shoes were mentioned in the article, and so I’m wearing my dark brown, vintage, leather strappy platforms in what I believe is a circa-1946 style. To link in my shoes (like the article mentioned), I’m carrying a brown faux-alligator leather 40’s style purse, handmade by me from a free online pattern and blogged about here. The straps fold over into one another to close the box top. 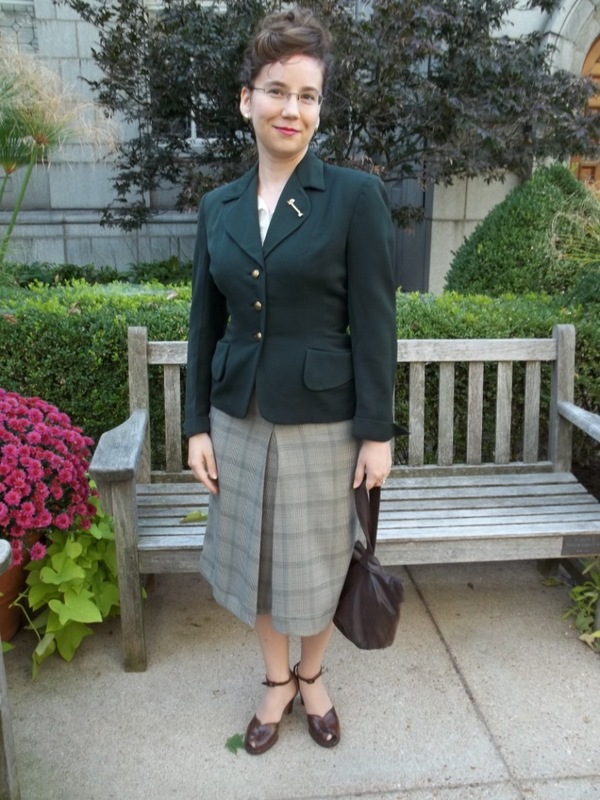 “Brown Proves Popular” article’s mention of silver and grey hound’s tooth check, so I personalized the idea with what I had on hand and sewed a silvery grey Glen plaid center pleated skirt using an old Advance #3964 pattern from the year 1945. The skirt’s fabric is a thick rayon acrylic as warm as wool. 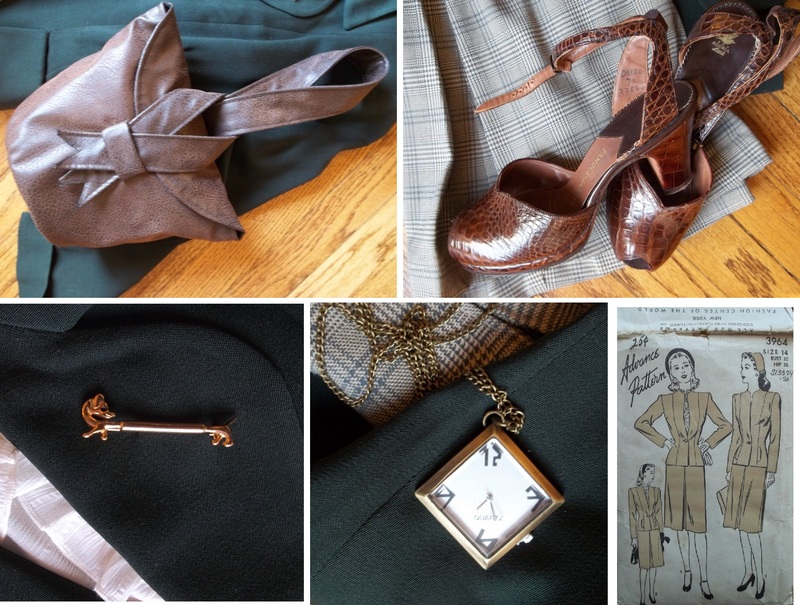 Green was mentioned throughout, so I am wearing a vintage heavy wool suit coat, with lapel pockets at the hips and turned back cuffs. This jacket was a gift to me from a close friend of mine who shares my vintage and sewing enthusiasm. Both jacket and shoes are “Famous-Barr” brand. I have enough extra fabric to make a matching jacket for to match the skirt, and I’m hoping to get to that sooner than later and make a post on the whole outfit. We’ll see! 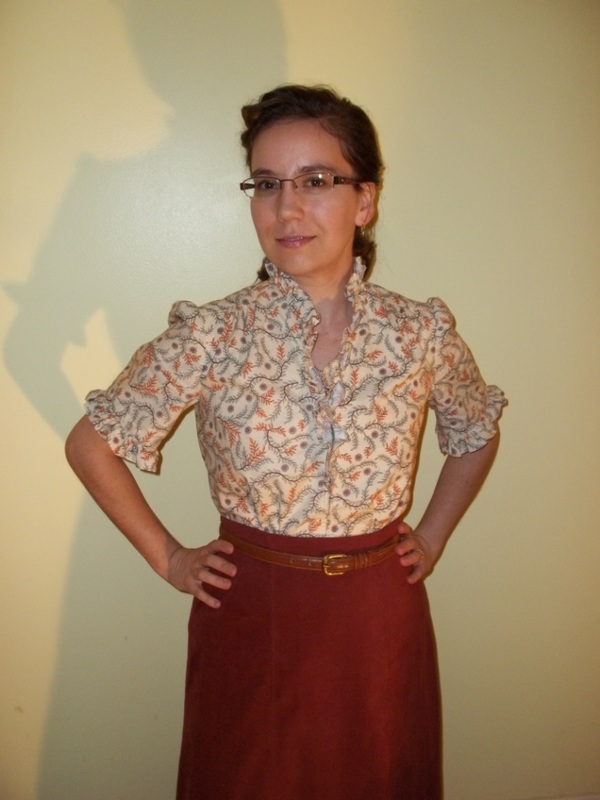 Here is a little different style of a 40’s top to add more variety into vintage sewing. Just when you think you’ve got a decade understood, wham…here comes a style to throw a wrench in your wheels and keep you from thinking you know it all (as in my case). History, and especially the history of fashion is a bottomless pit of info – I hope you enjoy the dive in as much as I! 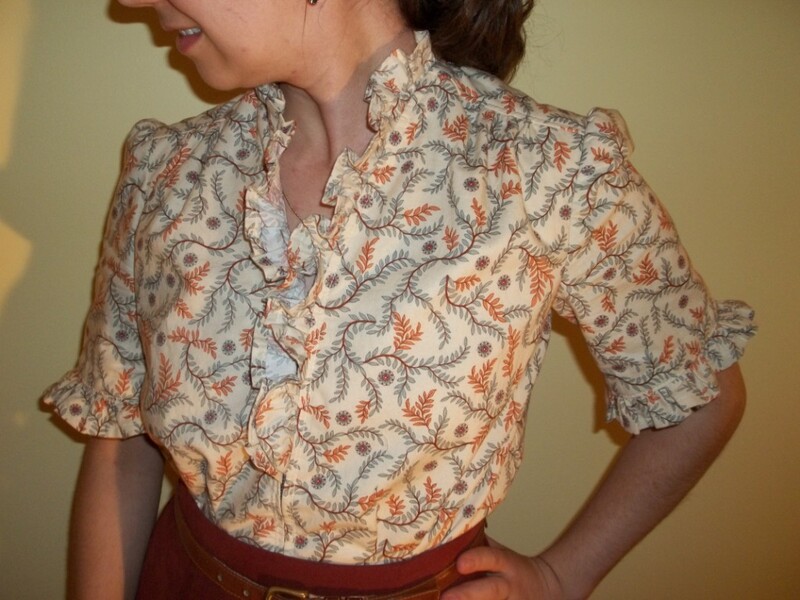 This 1943 blouse definitely has a country-style look that easily reminds me more of the 1870’s. It was never supposed to end up like this – it just happened mostly because of the homey, almost too cute, tiny floral print on the cotton fabric. I really enjoy doing gathering and small details, so with the ruffled front and sleeves this blouse was definitely “up my alley”. I just have to be careful how I style my hair and pair it with bottoms or it becomes something from “Little House on the Prairie – does 1943”. I should call this project the multi-decade mash-up top! 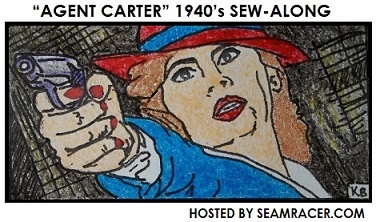 This is another “Agent Carter” 1940’s themed post. FABRIC: An ultra-soft 100% cotton in a tiny floral print (a mix of small portions of the colors steel grey, dusty blue, rust orange, dark brown against a background of creamy ivory). This cotton is thicker than most quilting cottons, so between the colors and the fabric weight, my blouse is perfect for chilly weather! 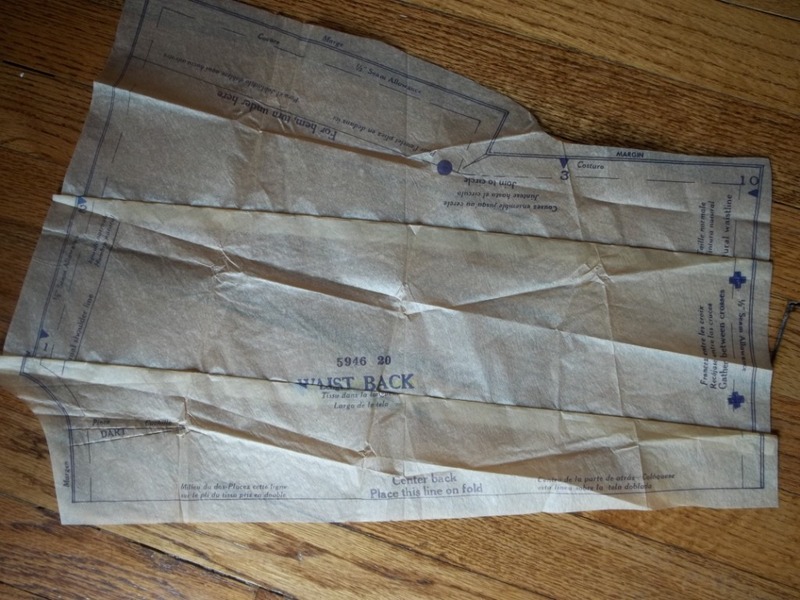 NOTIONS: Everything I needed was on hand already – a vintage grey zipper leftover from repairing a 1960’s era dress, thread, and bias tapes. TIME TO COMPLETE: I was finished on November 9, 2014, after maybe 10 (or 12 at the most) hours. This was my Thanksgiving Day outfit – perfectly roomy and comfy, perfect for visiting with family and eating lots of food! 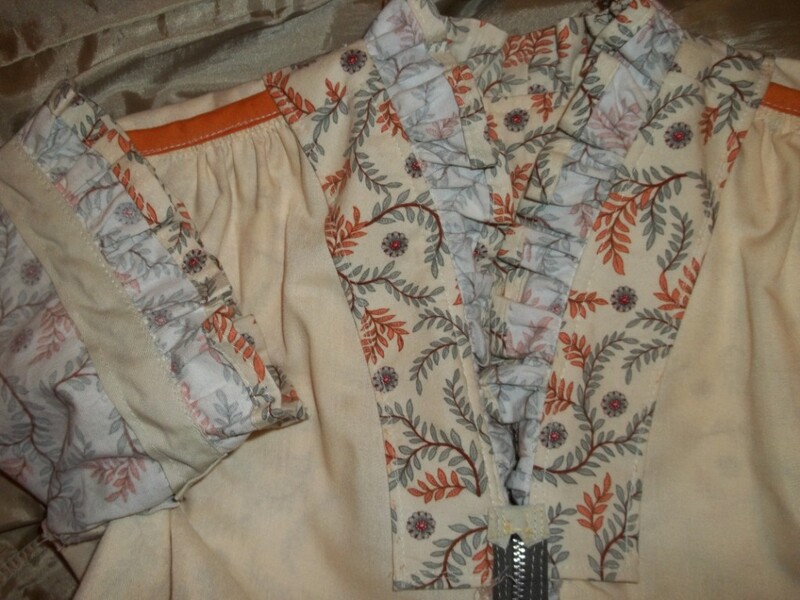 THE INSIDES: The blouse’s side seams are French seams, but the rest of the seams are bias covered. TOTAL COST: My only cost here was for the fabric, which was about $10 in total. 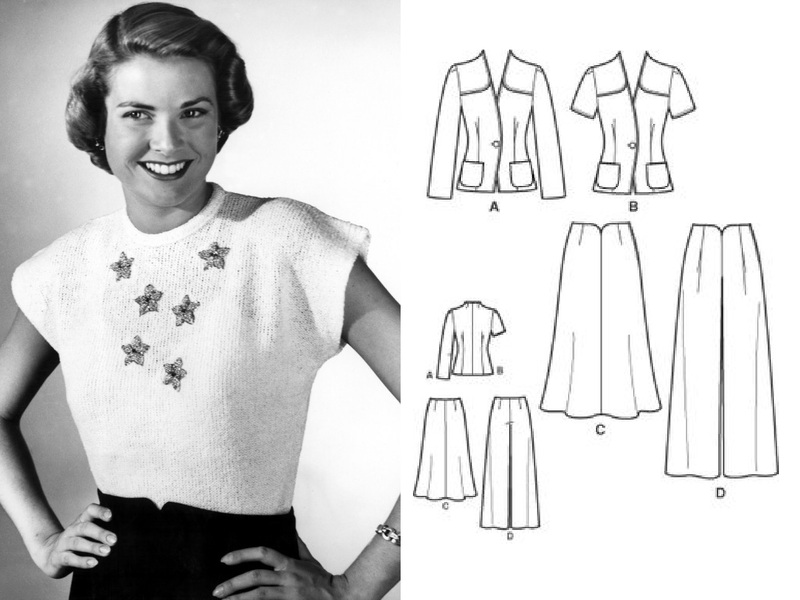 I’ve already used Hollywood pattern 1117 before to make the skirt with the arched front waist (see the finished skirt here). I am incredibly pleased with the finished skirt, and found its sizing and fit to be right on for me, needing little or no adjustments beyond a slight grading up in size. This was a good sign. 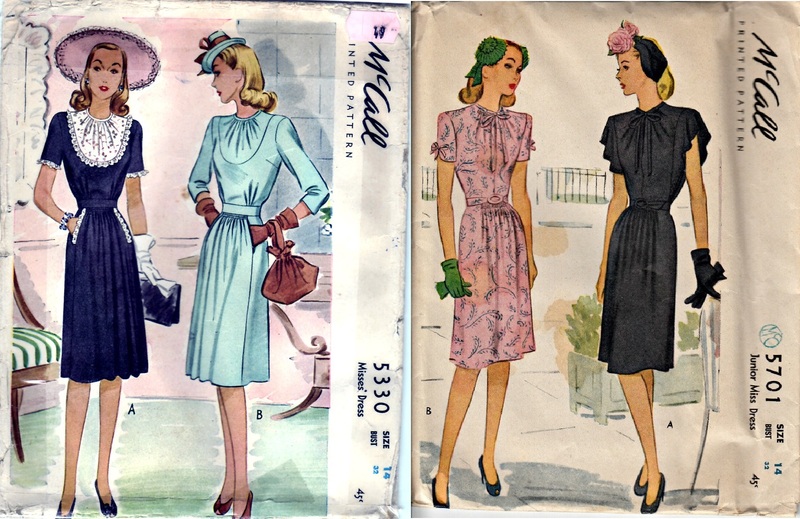 There are many vintage original patterns (between the 1920’s and 1940’s) that I find seem to run wonky in the sizing. Not all of them, mind you… but I’m getting to a point where I can surmise which pattern brands have predictable sizing (I’ll save this discussion for some other time unless you want to ask me for my opinion). 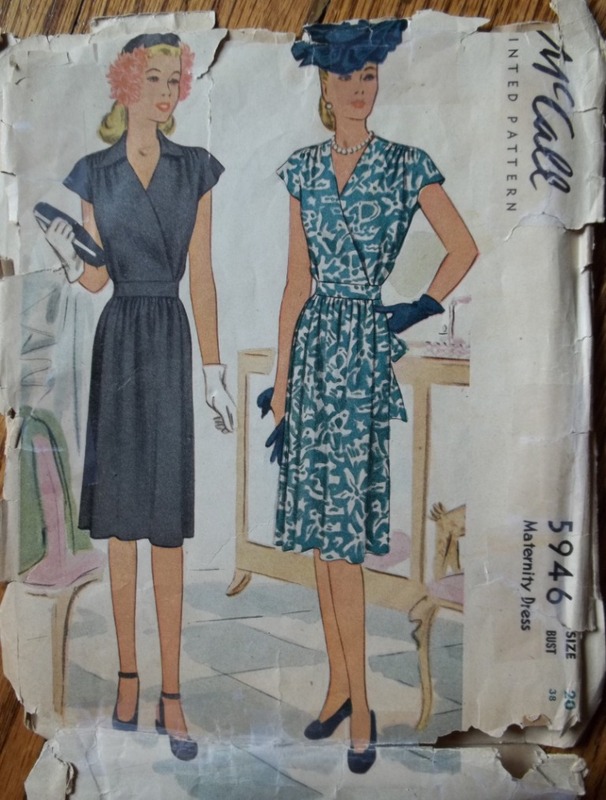 However, when it comes to a pattern that has separates, once I sew up one piece from a pattern, such as a skirt, and find that I like the fit, then I feel quite safe to make the other pieces, such as a blouse and/or jacket. 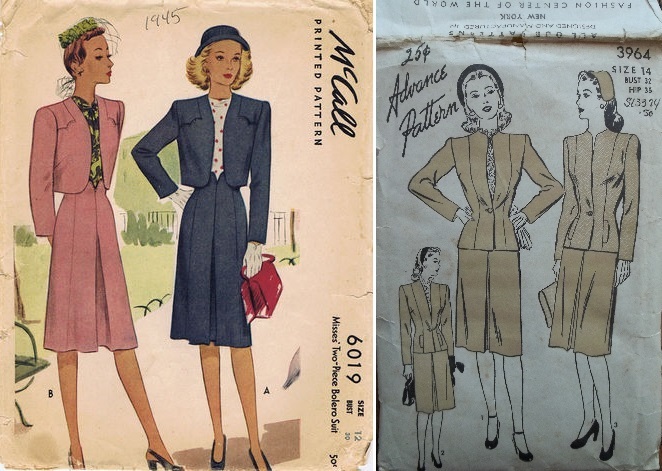 The situation just mentioned with vintage “separates” patterns is what led me to making my 1941 military wool suit set (post here) as well as this 1943 “Little Blouse on the Prairie”. I’m beginning to really like the old Hollywood patterns now that I’ve made a set from #1117. 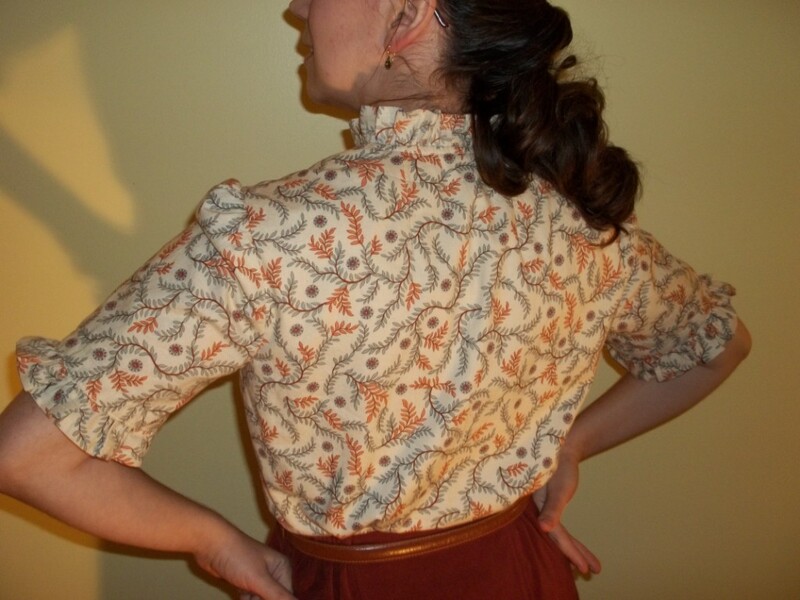 This really a sweet twist on a basic 1940’s blouse design. 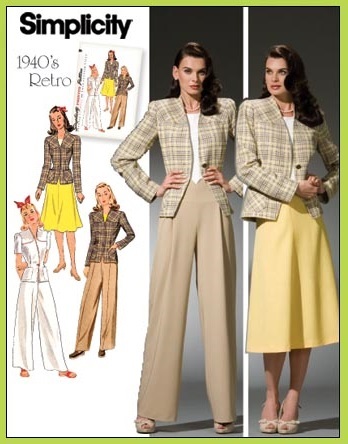 It has simple sleeves with slightly gathered shoulder tops, and the conventional 40’s tucks that end at the waistline for a bloused effect. There is also the classic wrap-over the-shoulder seams which end at high chest at the collarbone. 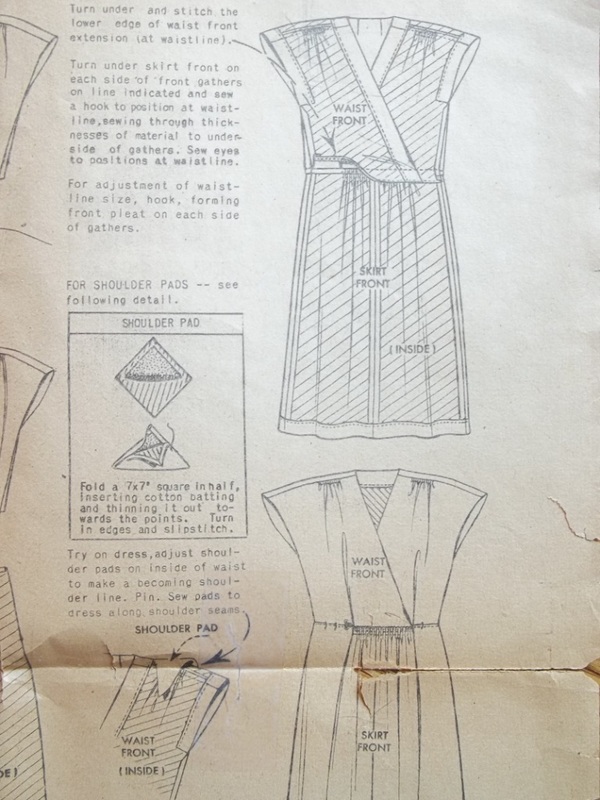 The tops of the front bodice are gathered, not pleated as some blouses, into the wrap-over shoulder seam. I added some extra length to the bottom, as is my norm, to make blouses easier to stay tucked into a skirt or trousers. It’s amazing how such a little addition as strips of ruffles change the look completely. This was the tiniest gathering I’ve done in a while. I was tempted to get out and use my giant monster-looking ruffle attachment on one of my old sewing machines, but as I needed the strip to be a particular length, I thought better of it. There are two very long strips for the neck that get sewn together at the center back of the neck and taper at the ends, while the sleeve ruffles are two long strips that get sewn into a circle. As per instructions, the strips for the ruffles are single layer, and cut on straight grain, with the outer edge receiving a narrow ¼ inch hem. I wish I had done a double layered bias ruffle instead, just because I’m not sure if I like the wrong side of the fabric showing, although my blouse turned out just fine the way it is. All I know is it sure was a challenge to get all that ruffle gathered onto the edges. I enjoyed it, though. My hubby was intimidated when he saw the neckline chock full of straight pins to keep the ruffle down for sewing – I’m talking about a whole box’s worth of about 200 pins. If I had put it on then… Ouch! Firstly, I sewed the ruffle down to the neckline and sleeve edges first to keep everything in place and take out all those pins. Then I sewed down the bias tape over the ruffle so the raw edges insides would be covered when the ruffle gets turned straight out. All this bulk and layers of fabric was a challenge for my Singer, and I should have used the Brother machine’s heavy duty setting. 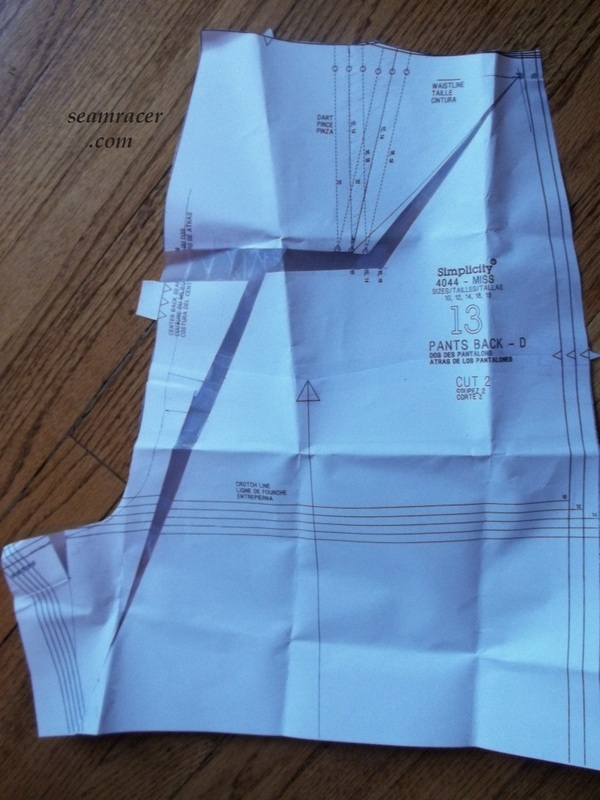 If you are doing this pattern, or something similar in the way of ruffled edges out of a heavier material, if might be a good idea to use a machine or setting that can tolerate substantial thickness…don’t break your most important tool for creating with fabric! Whoo Hoo! Don’t mean to make it look like I’m flashing you here. I was totally lost and confused in regards to the instructions about the zipper insertion so I made up my own and installed it in the center front. 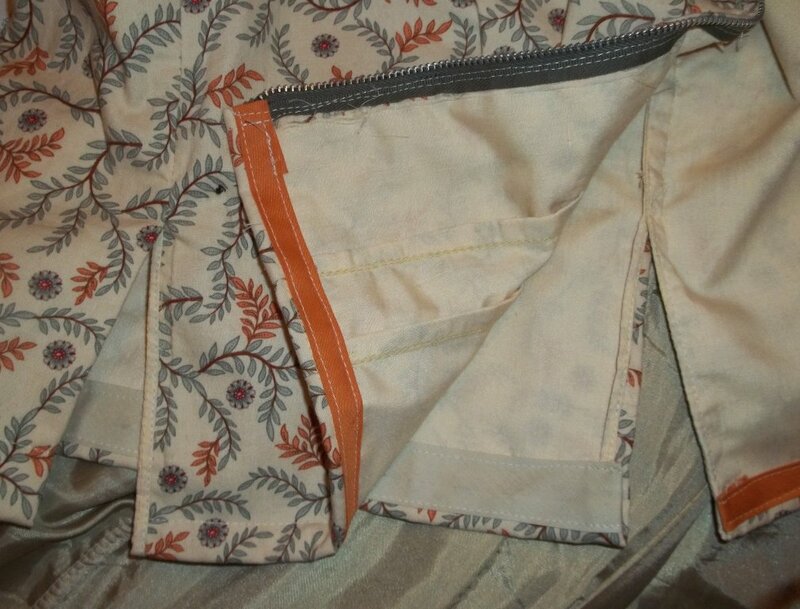 It seemed I was supposed to add the slide fastener in the center front because the instructions said a brief mention of closure between the ruffles and there wasn’t any markings or mention of where to position the zipper on the side. I went all out vintage with an old original zipper in the front – I figure it should be stronger than the modern zippers (which was all that I had on hand at the time) with its metal teeth. I didn’t know how else to do it but the connected end of the zipper (covered with bias tape) is at the top of the neckline, where it comes together. This makes for a slightly awkward and snug fit to get the blouse over my head, and I have to remember to fix my hair after and not before putting it on. 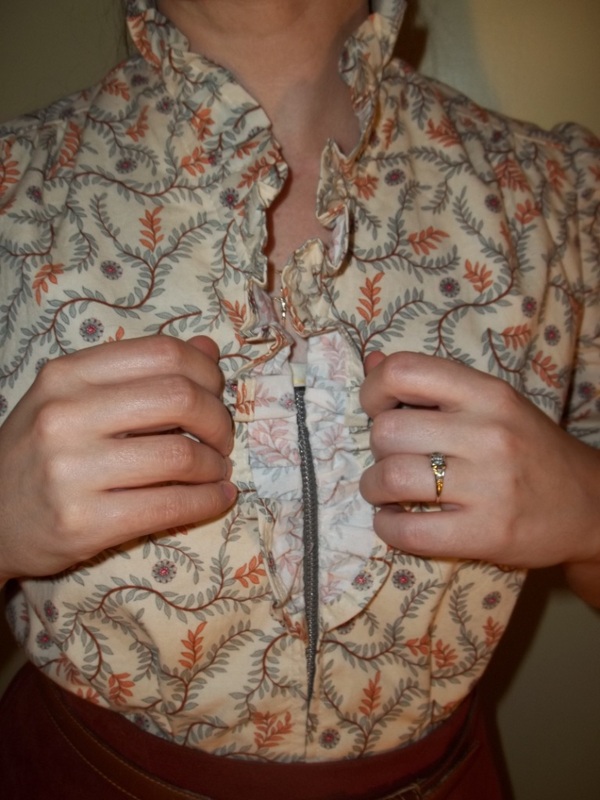 I would have rather put a modern separating zipper, but I didn’t have one on hand, and couldn’t think of the harsh modern look it would have lended, ruining the overall quaintly vintage theme of the blouse. Do you also try to stick with what you have on hand? It is a challenge but feels satisfying in the end. 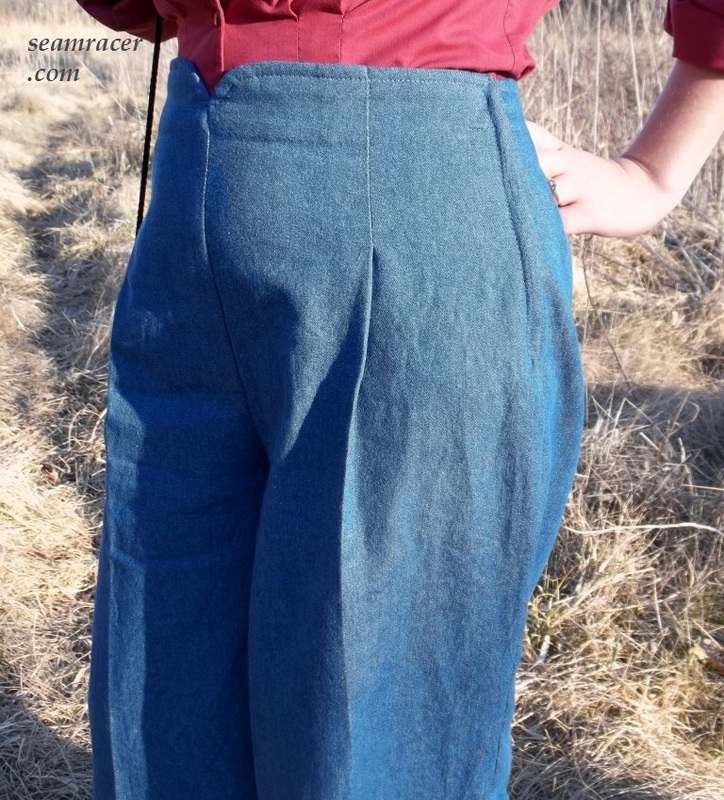 After my blouse was completely finished, the hips had just a bit too snug of a fit for the blouse to lay right on myself. 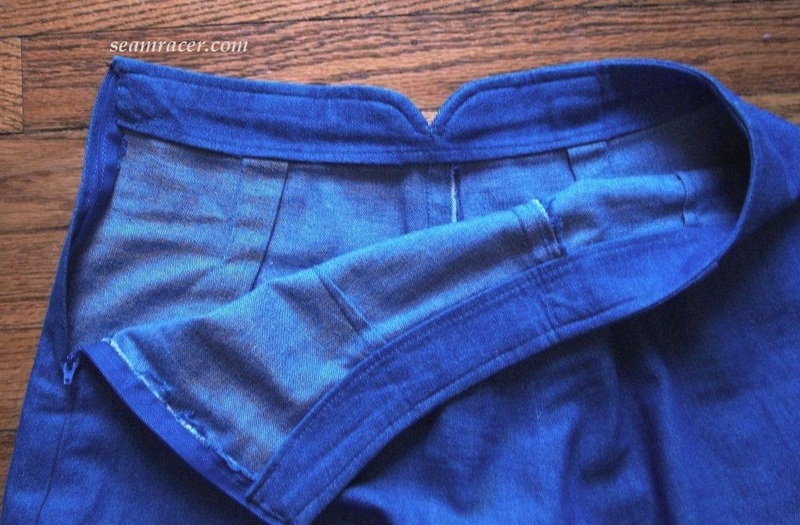 So I unwillingly unpicked (I hate unpicking) to make slits on both side seam bottoms – much better! 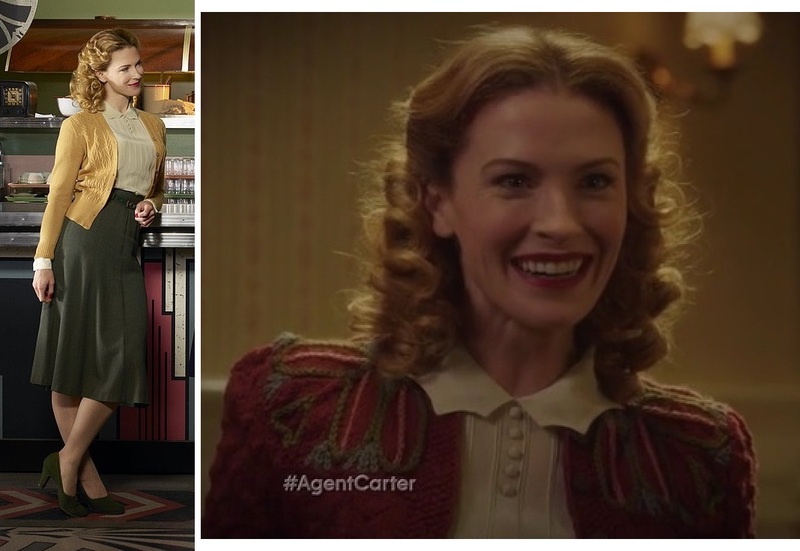 My “Little Blouse on the Prairie” is so very clearly the style that the character of the villainess Dottie Underwood wears in the Marvel television series “Agent Carter”. My blouse’s secondary nickname in my head is actually “Dottie’s style blouse”. Dottie “supposedly” came from Ohio (the mid-west of America), from farmland territory. 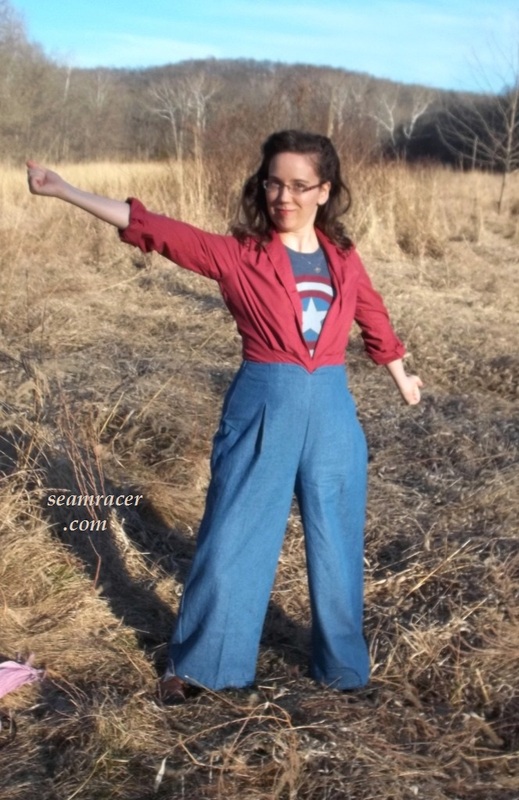 She wore homey, sweet, toned down fashions to make her fashions play that part of an innocent country girl and help her seem the opposite of what she was to Peggy Carter – a dangerous threat. She wore cream colors, pastel yellows, olive greens, and small floral prints and cultural-themed sweaters – all of which is in my ruffle front blouse in this post, if only in very small doses. Not that I am the type of person to want to play the par t of the evil character, but, just for fun, I did my best at making an “evil Dottie” photo. Maybe I succeeded too well because hubby was like, “Oh, goodness, whoa…” as if he was at the receiving end of my tough attitude. Gee, I was only having fun! It is fun to put yourself in someone else’s shoes, especially when it comes to the decade of the 1940’s, although things were tough for a woman in that decade. This ruffled blouse my not be my favorite 1940’s creation, but this project has won me over to wearing it again and again by its features. It fits so well in the arms and shoulders and bust plus the ruffles and thick cotton is nicely warm in the winter, all the while still keeping me a comfortable temperature inside buildings by having the short sleeves. I have a big box store brand micro suede skirt which I like to wear with my blouse (you see it in our pictures). 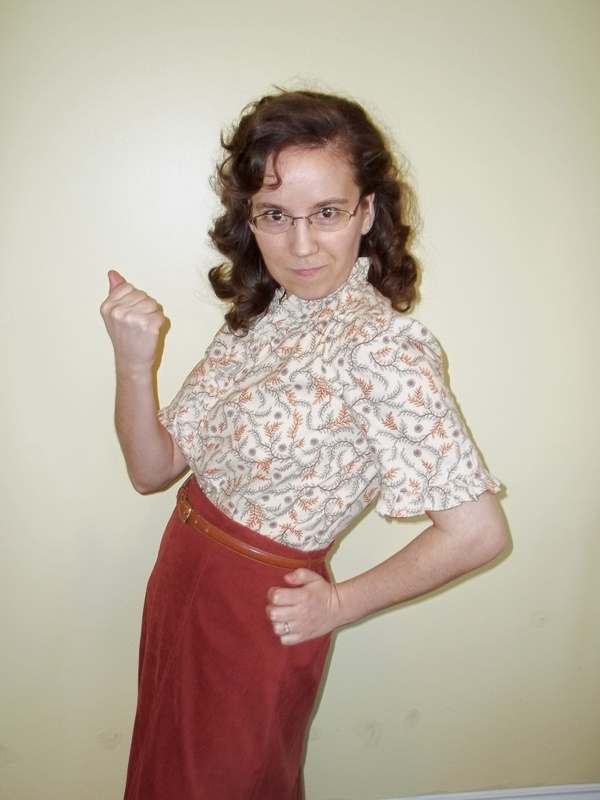 It has all the feature of a forties skirt with its high waist and six-panels, shaping it into an A-line perfect for activity and, ahem, martial arts kicking like Agent Peggy Carter (I wish). 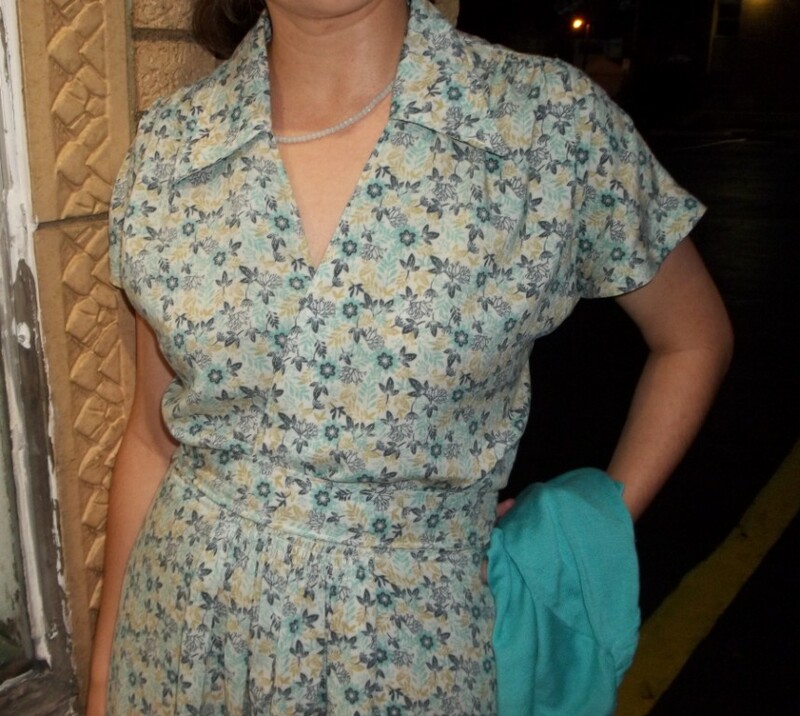 The ruffles of my 1943 blouse are another interesting fashion feature of the decade of the 1940s. They are something you see a whole lot of in the 40’s, and when you do they are often, like my blouse, used as an easy way to jazz up a garment (especially the small ruffles that don’t require much extra fabric to make). 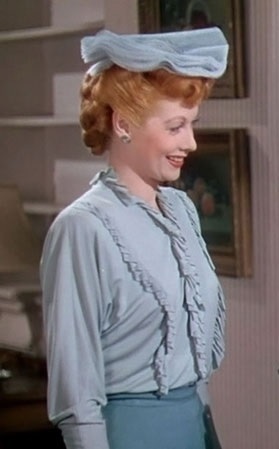 After all, a ruffle front blouse was good enough for the famous Lucille Ball to wear in a movie made the same year as my top, “Best Foot Forward” of 1943. 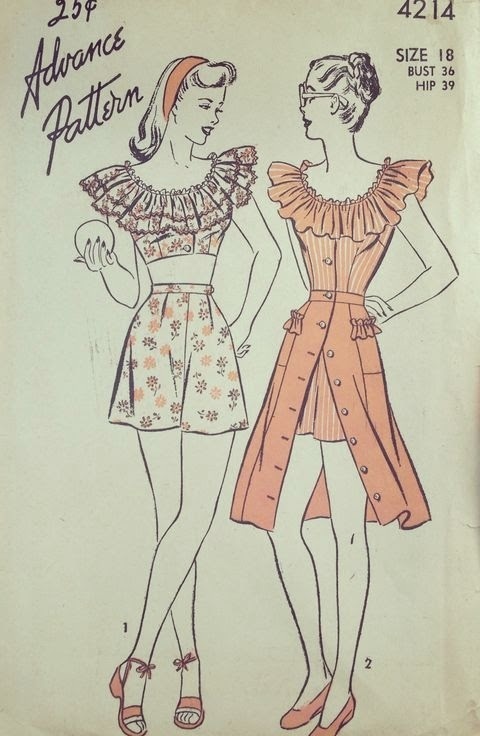 Ruffles and ultra-feminine features like ruffles, bows, and quaint country prints (such as the Advance #4214 play-suit pattern shown at left) had begun to be popular with the Bavarian/Tyrolean cultural fashions beginning at the late 30’s/early 40’s, lasting through the entire decade of the 40’s. However, I find peasant blouses to be the one remnant from that trend that is perennially appealing…after all, the 1970’s brought them back to be used in our modern times as well. Do you have an outfit that you made which is different than what you normally like to wear, but you find yourself liking it after all? 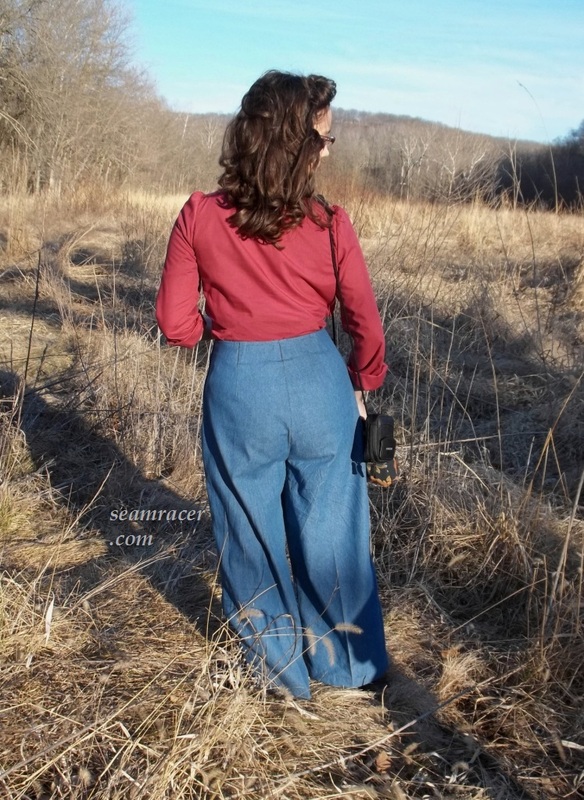 I feel that is one of the best perks to sewing your own clothes…to get to try all sorts of new, different, and unusual things and have fun experimenting with fashion, such as I did with my “Little Blouse on the Prairie”! 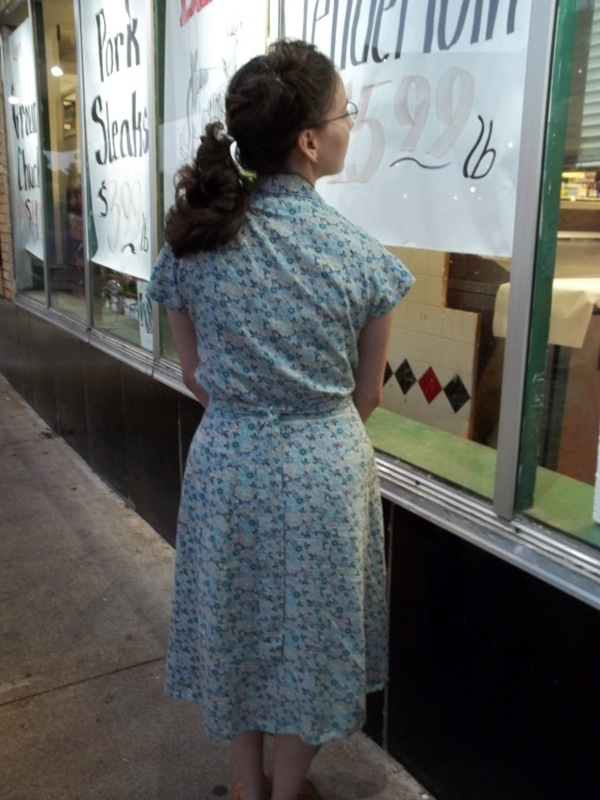 Due to lack of participation and/or feedback, my “Agent Carter” 1940’s sew-along is over, as promised, now that Memorial day has come and gone. 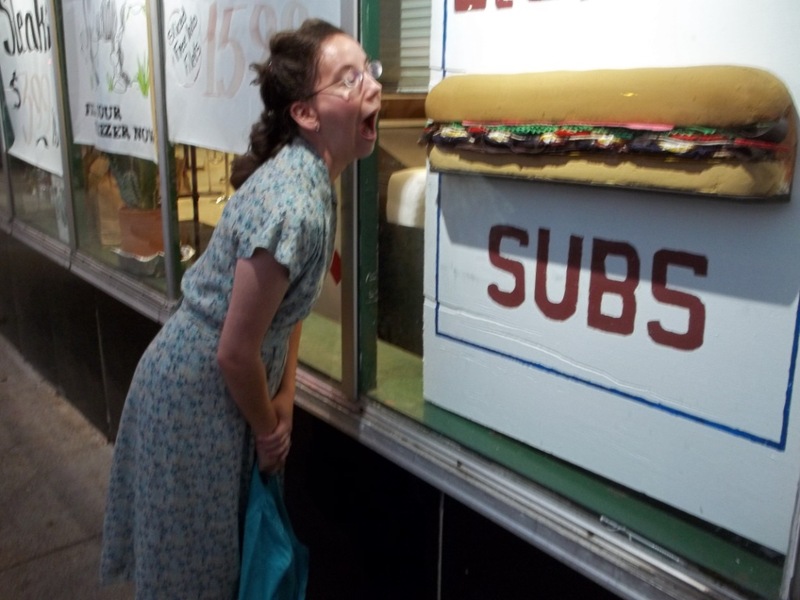 However, I myself am sad to see it go, and will continue to post “Agent Carter” inspired projects and informative 1940’s era inspiration and info until the 4th of July, my country’s Independence day.